There are 2 different warm up exercises below. Warm Up #1 contains 4 videos to teach automated movement, sensing and sound. Warm Up #2 contains 1 video of how looks can change interactively. For your first script, create these blocks. When completed, the cat will bounce around in your game window. Complete the script above and then make it better! Take out the "if on edge, bounce" and make your own "if" block. 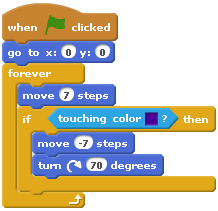 You will also want to create a fence using the Scratch graphic editor. When completed, the cat will bounce around inside your fenced area. Next, can you add SOUND? Can you make a sound effect whenever the cat touches the fence? If you have difficulty getting the SOUND to work, here's a video to help. make a new fence using the left graphic buttons and create a new fence (called "boundary"). Then, try this different "touching" block. If you have difficulty with this, try this video to help. Be sure to save your work from Warm Up #1. Then, choose FILE --> NEW to be ready for the second warm up. This quick warm up activity helps understand how to make interactive visual changes. Use the "Looks" palette to find "set color effect to 0". Then, use the "Sensing" palette to find "mouse x" and "mouse y".